Modern technology has become a crucial part of today’s management structure. Every passing day it is evolving and simplifying our life by turning gruelling tasks into automated processes. Similarly, our product is also evolving, to simplify the operations of the institutes to improve the productivity by allowing their staff to make more accurate and precise decisions in a minimal time. It is necessary for every actor of an institute to be connected to each other promoting not only a healthy working environment but also allow the staff and the community to remain carefree. With a better communication between the staff and parents/students, the responsibilities like fee or assignment submission are carried out in a timely fashion. To make this happen, we would like to introduce our new internal messaging system, which can be used to create this ideal learning environment. This messaging system comes with an improved interface and ease of use. It is designed to be a complete communication system for the institution. Using the contained messaging module, the institutions can send out targeted information to parents and students about school events, fee dues, to teachers about upcoming PTA meetings etc. This minimizes parent’s anxiety which is a result of overdue duties, which could be easily eliminated by setting timely reminders. 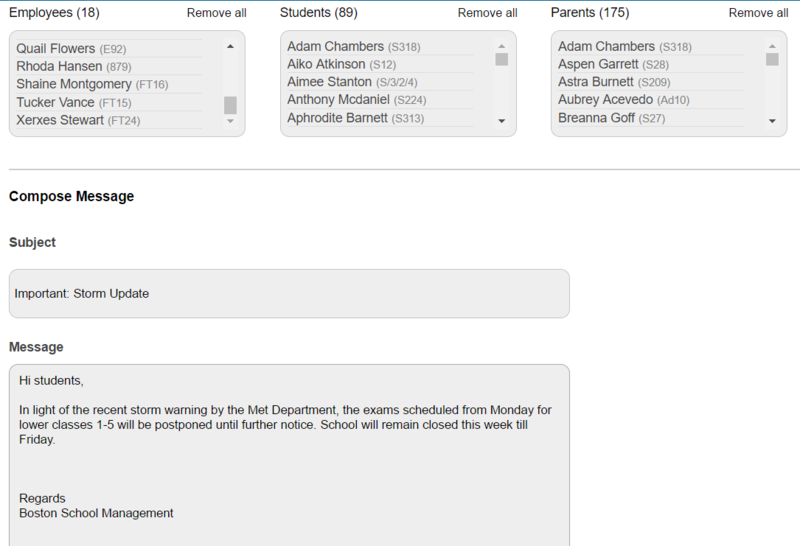 This keeps everyone updated about their assigned responsibilities. This system is not only fast and easy but also eco-friendly, it further is a saving on expensive purchases for receipts, notices and other announcements. Holidays are a time for relaxation and fun for everyone, primarily young kids. During these days of mingling with your friends and relatives, it is quite easy to forget about the assigned work and projects to be submitted post the holidays. Mostly, the students keep on delaying such activities due to either boredom or underestimating the amount of effort or just simply forgetting about it. This could have a serious impact on their rest of the academic year, which could also result in them falling behind in some of the key subjects. To remind the students of their handed out assignments, scheduled messages tailored for their needs can be pushed out as notifications. This’ll help them keep on track and remain updated on their progress. Read more: How to manage students records? The role of parents is vital for a child to grow into a responsible adult. Therefore, they try to be updated about their ward’s education and keep them on track when they’re falling behind the curriculum. This involves attending meetings, going through their progress report and various allotted assignments. Sometimes, due to a busy schedule of their own, it becomes quite difficult to keep updated which affects their child’s performance and growth. Using the internal messaging service, institutes can instantly send notifications and keep them updated on various activities. Being a student’s primary educator, the role of teachers is essential towards shaping a career which isn’t easy to imagine at the beginning. Sometimes, they are not in touch with every student in their class which either results in the miscommunication on their part or an omission of the same. To keep the students informed about the scheduled assignment dates, mini-projects, and various other home assignments, teachers can make good use of the messaging service to get their intentions known to everyone in a timely manner. The responsibilities on an administration entail duties which need to be performed timely and recurrently. Their duties are not only essential for the smooth operations but also need to be quite punctual which brings in a dire need for a good notification system. Their other duties being emergency services and disaster notifications also require a need for an efficient messaging service, which makes the messaging service an excellent fit for them. 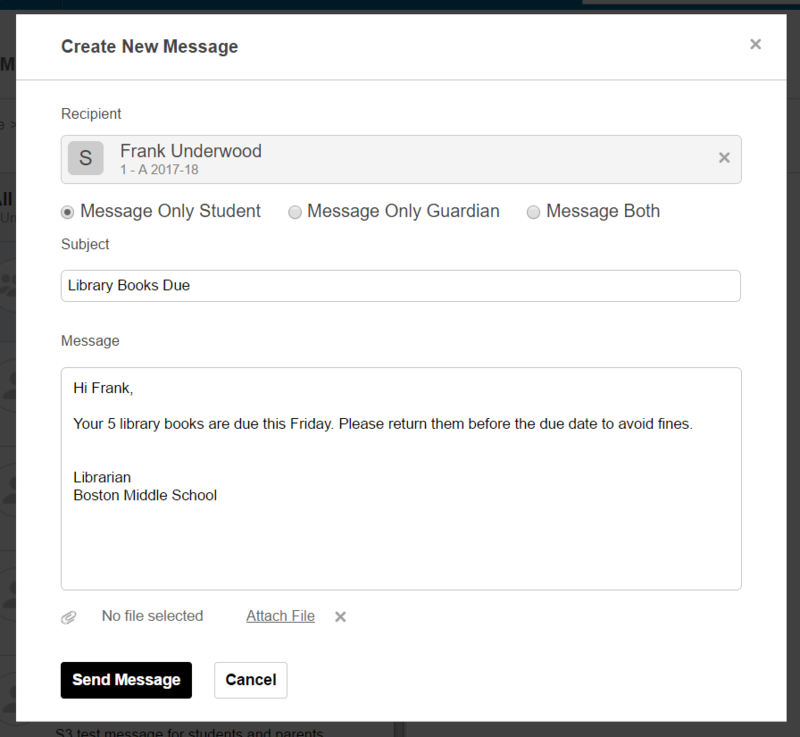 Admin can use broadcast message feature in messaging portal to send out bulk messages. The message settings feature allows admin to control who can send messages and to whom. If the institution policy does not allow students to send direct messages to other students, this option can be turned off. 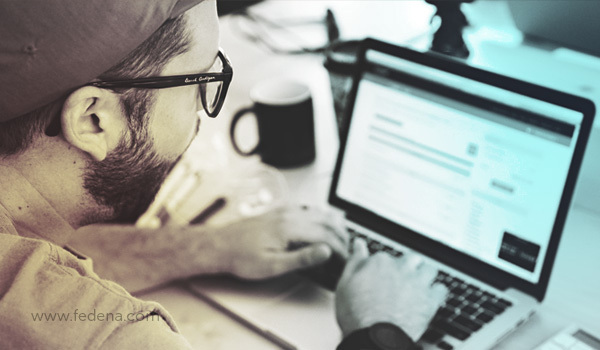 Previous PostPrevious Can Your Student Administration System Handle These 3 Problems?